Imbolc has just passed. A cross-quarter day, also known as Groundhog Day, tucked in between the winter solstice and spring equinox. The day that Joe and I begin to celebrate spring. More winter lies ahead, but the seeds are stirring in the soil. I will be traveling again this year. Stepping back out onto the Good Bee Road after a few years of staying close to home and hive … rebuilding and resettling after the house fire in 2016. In many ways, I have been on retreat. Silence has become a more intimate companion. So many words and ideas have slipped away into the compost, including some of my own good ideas about how to abide with the bees and what they need. I have come to cherish how little I know. Amidst the chop wood, carry water seemingly infinite tasks needed to create a new nest, I had even more time with the bees. I discovered other colors of pollen, from pastel to neon, and was astonished to discover that some honeybees exit their hive flying backwards. (How had I never noticed that before?) I laid down in the bee sanctuary, soothed by the smell of new comb and the thrumming humming bee-song soundscape. I read poetry to them (a favorite by Yunus Emre, Come, see what love has done to me) and played them Karsilama and Masmoodi on my frame drum. 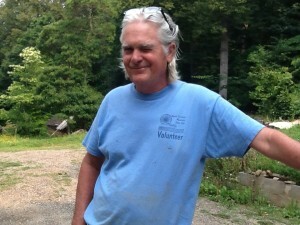 I shared stories and brought the news … and I emptied my mind to hear theirs. I wept over the death of friends, including bees, and some of the great sorrowing in the world. I marveled as these mistresses of alchemy transmuted the precious nectar of thousands of flowers from the gardens, fields and forest into honey and also wax, the sacred sacraments of the hive. 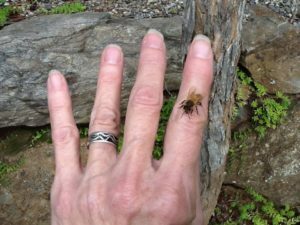 And sometimes, by grace, a singularly illuminating moment would come along … like one fragrant afternoon last summer when a forager landed on my hand. She rested a while, her tiny abdomen heaving from the pollen load, before returning to the colony above us. I wept to know my hand was safe harbor. 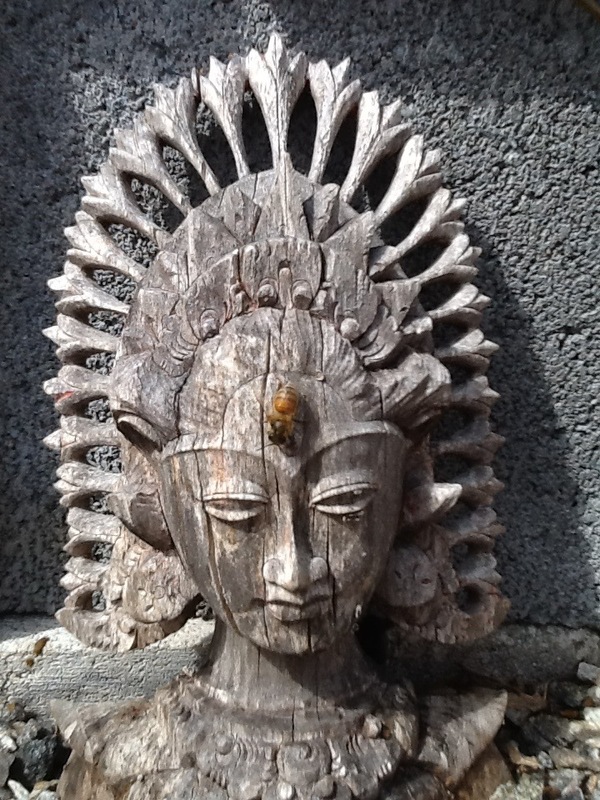 In that sacred bee time-infused moment, all Otherness dissolved. I felt gloriously undifferentiated from all of life … no veils, no seams, no borders, no edges, no species, no me and non-me, no bee and no beekeeper. Everything was suffused with a deeply tap-rooted, familial and familiar connectedness. In this holy-rolling zone of revelation, presence and love, I remembered my place in the divine matrix of wisdom I share with the honeybees and all life. The intelligence that moves the whole universe of bees along, also moved through me. It was here in the bee sanctuary, beside our burnt then rebuilt home, where I lost my heart and found another bigger one amongst the ripe honeycombs. I return to Turkey this spring. Mama Anatolia has long had my heart … and my heart is full. In our region, the bees are really struggling. We had sixty to eighty percent colony losses last winter. And the number of casualties already reported in this early new year is breaking my heart. When people ask me what I think is going on with the bees, I could answer: pesticides (and other ides), the use of Roundup and dicamba, neonic seeds, and compromised genetics. And there is still a strong chorus of beekeepers that shout Varroa! as a primary source of bee ills. But for me, all these challenges point back to many poor (to terrible) human choices and decisions … to our tendency to sleepwalk and forget our fellow family on this precious Mother of an earth. It is in this deeper field that I have set up camp. Some different quality of presence and listening is unequivocally required of me and I am determined to pay attention. I do not want to save the bees; I want to wake up. I am not asking them to stay; I am deepening my practices and capacity to be conscious and respectful, so they might be persuaded from leaving and thrive in that choice. I remain planted at the feet of the Bee Nation … robust, sentient ambassadors of life who were here millions of years before I was born. A truly venerable first First Nations people. These last few years off the radar have been very unburdening. A profound stillness is seeping into the fertile soil of me. Like the seeds that hang their hats in the quiet earth before emerging as the plants they will become, I too am swimming in becomingness. My journey is about love. My Journey Is About Love. My life is distilling down to that invitation … and really to that one word. Love. May we be awake, aware and loving. May we extend our hand to all of life in a kind way and a different kind of way. May we bloom in the soil of our soul no matter the weather of these times. May we live as if love matters. May all bees be well. PS This one’s for you Vicki Ghost Horse … and you Michael Thiele. And always you, Joe Roberts. My life became more full fat with miracles the day honeybees flew into my heart and onto our land here in Appalachia. One of the early epic moments I experienced with them was in April of my first spring with-bee, when something happened that no one had ever told me about. Joe and I had gone out to enjoy the music of one of our most favorite artists in the world, Omar Faruk Tekbilek, a wonderful Turkish musician, singer and composer whose work is profoundly devotional and inspiring. We came home from that concert with our hearts blown wide open. It was late. Joe went to bed, but I couldn’t sleep so I went to the bee sanctuary. Night-time in the bee yard is magical; it is governed by starlight and the moon, and not the light of the day sun. The symphony of sounds that emerge from the hives, and from the choir of creatures around them, is its own sacred soundscape. I was about to begin my evening ritual of putting my ear to each hive to say goodnight and tell them how much I loved them. As I started to incline my head towards the side of one hive, the moon suddenly emerged from behind the ridgeline and crested the trees. All of a sudden the whole bee yard and everything within sight … the trees, the hives, my skin, the ground … was bathed in silver blue light. I had forgotten there was a full moon. At that same moment, I completed the arc of putting my ear to the hive beside me and heard the most extraordinary cries coming from the heart of that colony … like the haunting call of seals or birds on a distant beach. Nothing was wrong; nothing was frightening. I felt like I had fallen down a rabbit hole into some kind of otherworldly, moonlit bee dream. Isn’t that astonishing? You can hear tooting and also some quacking, but it is the piping, those long sustained higher notes that mesmerized me. I phoned my friend Carl first thing the following morning and he said I had heard queen piping, a call sometimes made by virgin queen bees, most often before they are born. The week before, I had counted eight peanut-shaped queen cells (the birth chambers) in that hive. It takes 15 – 16 days for a queen to be born, to change from an egg to a larva to a pupa and then eventually emerge from her cell as a young adult. She hatches from the bottom of her cell and generally, the first queen born gathers herself, travels to the other queen cells (the ones not yet quite born) and kills those other contenders by stinging them through the wax walls of their birth cells … because only one queen will reign in a hive. 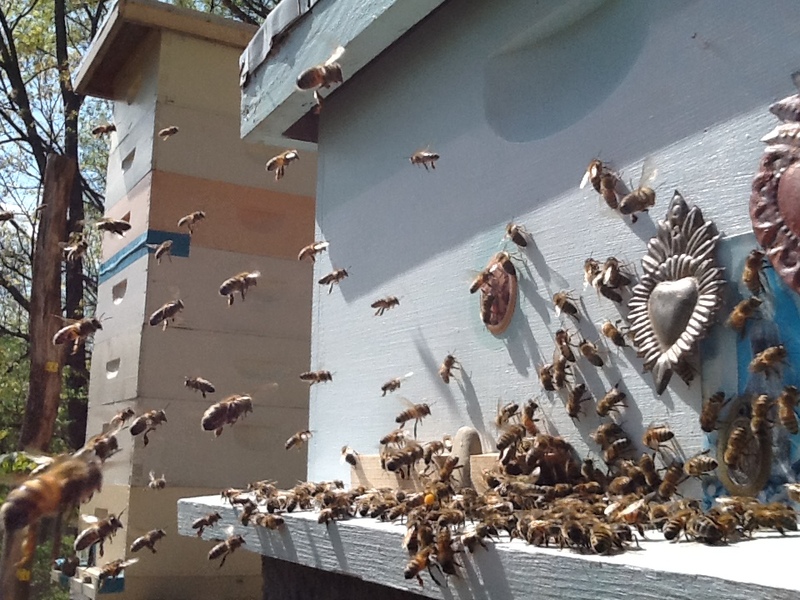 Michael Bush, who is a natural beekeeper I appreciate, describes how a virgin queen pipes: she coordinates her breathing, the buzzing of her wings and the vibration of her body, which she places in contact with the comb inside her birth cell. The resulting piping resonates like a sort of sounding board in the hive, passing the vibrations along the comb to the bees. Some of the prevailing mainstream thinking about this phenomenon is that it has to do with rivalry. Some call it a form of battle cry between competing soon-to-be born queens who are assessing each other’s fighting abilities. Alan Chadwick, the legendary horticulturist and visionary, called it a Valkyrian cry, a sound that pierces the veil. And there are other theories, but this is still a territory of great mystery and, to me, is one of the hallowed songs in bee life. I have heard it many times over the years and every time I do, I feel like I am in the presence of some kind of high church, holy-rolling Moment in a hive. I call this The Song of the Unborn Virgins. Three of the primary ways that bees communicate with each other are through dances (inside and outside of the hive), the distribution of pheromones around the colony, and vibration. Bee life is a whole world of intelligent, purposeful vibration, felt by the bees’ legs and bodies through the resonating structure of wax on which they stand and in the air around them. Bees are immersed in and depend on a constant very complex and sophisticated exchange of vibratory signals. 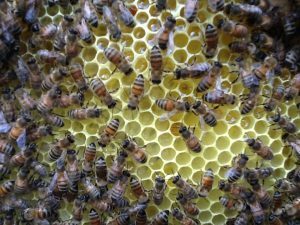 When we think about hive health and a colony thriving, people often focus on things like the size of a population, the laying pattern of a queen, or how much nectar is being gathered and honey stored. But there is a whole other conversation that has always interested me which is the aural culture and health of a hive … the vibratory world and its relationship to the vitality and longevity of that colony and really, part of who that colony is. Queen piping and other bee songs are full of intelligence, purpose and intent. They might range from winter cluster humming to the high-pitched keening of a queenless hive, rumbling forms of distress, the buzz of wings as workers come and go on a warm weathered day, the fanning of wings to maintain temperature and ripen nectar, the fuller bodied lower register and pitch of drones coming home in the afternoon … to queen piping. The bees are singing and they are vibrating the life of their colony into continued being. My own experience of queen piping leans away from the battle cry thing. I am much more interested in the vibratory field that the queen’s call creates, which I experience as a kind of queen bee darshan (a Hindu word for a blessed transmission or transmission of blessings). I believe this sacred sound event, when it happens, is an essential part of maintaining a continuity, identity and integrity of essence in that particular lineage of bees. There is a Sanskrit word, anahata, which means the un-struck, inaudible sound behind all of reality, from which reality is born. And the audible sound closest to anahata is considered to be the buzzing of bees. My friend Layne Redmond called it the celestial buzzing of creation. I also experience queen piping as an emanation from the heart of creation, like a sort of Aum but differently primal, feral and femininely mysterious … which is how I believe the feminine at its heart recognizes itself. Queen piping also has resonance for me with the concept of songlines, which is something our friend Uncle Bob Randall used to talk about. 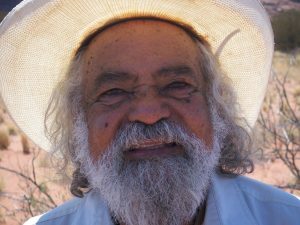 Uncle Bob was a special teaching uncle and elder of the Yankunytjatjara Nation in Australia. He was one of the great people of our time and a living example of Kanyini, the Aboriginal principle of unconditional love, responsibility, and what he called Oneness with the creative consciousness of the world. Uncle Bob told us a songline is a song of creation that energizes a belonging and connection with our place of creation, with everyone in that place who we are connected to (all of our family members that include all the beings, not just humans), and with the earth. He said that each child (or tree or bee or animal or any fellow family member) is born to a particular songline. When he was a child, Uncle Bob said that his aunts and uncles would teach him a lesson that could go something like this: They might discover the tracks of a snake in the sand one morning and then learn everything about that snake family and its wider family. This would include Bob’s own human family that lived there, as well as with the hill beyond the snake’s tracks, the tree alongside the path they stood on, and the red rocks that were over the other way. You were family with everything there and the songlines were part of what bound you in a sacred way. Over the years, when I hear queen piping, I think of Uncle Bob and what he had shared. Whatever the fullness of the queen’s call is really about, I also feel it is part of a colony’s songline. The queens, the one that will become the queen and all the other virgins whose lives may only last a few days more, are singing familial connection into being … announcing the imminent emergence of a queen and her essence into form, connecting the colony with that place on earth and with their other relations. In my bee sanctuary that would mean with the wasps, ants and lizards; the tulip poplar trees and white pines; the wild turkeys and black bears; the ridge to the north of the yard; the mountain the hives sit on … and with me. There is some sacred something going on. It is interesting to note that a queen bee can live three to five years. All the workers and drones, the great numbers of everybody else you see in a colony, only live about six weeks. So there is a big difference in lifespan between a queen and her fellow bees. 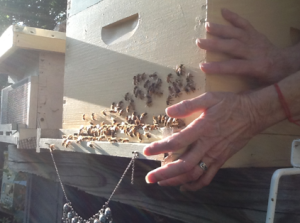 Where I live in North Carolina, an Italian queen bee (which is the type of bee many of us have in America) can lay almost twenty generations of bees (from eggs to hatched) in the warm weather months of one year. So if you multiply those twenty generations of bees per year times the three to five years of a queen’s life, I imagine a songline that extends its reach to an immense number of bees and beings. 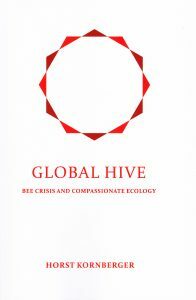 Several years ago, I talked about queens with Horst Kornberger who wrote a wonderful book called Global Hive: Bee Crisis and Compassionate Ecology. 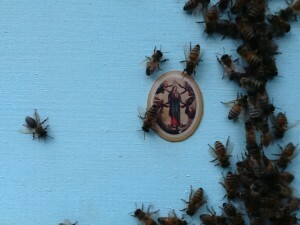 We are both concerned about the problems of requeening, which is a practice that modern beekeeping has come to embrace. 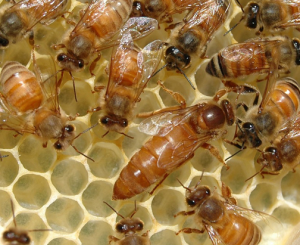 The existing queen in a hive is killed (or dispatched) and replaced, most often with a virgin or newly mated queen who is often from an entirely different hive of bees (and often from commercial breeders). 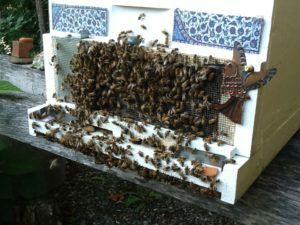 The new queen is added to a colony that was going along just fine with the queen they had from the bees’ point of view. Many beekeepers are strongly encouraged to requeen their hives every two years and now, even once a year, to ensure (I believe mistakenly) the health, vitality, and productivity of a hive. I am particularly disturbed by this choice and how common it has become even amongst non-commercial backyard beekeepers. 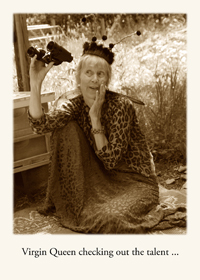 Horst describes honeybees as creatures of connectivity and speaks to the fracturing of the connection between bees and their queen due to requeening, which “tears at the invisible bond in a hive … tears this sacred relationship between the bee community and its queen”. 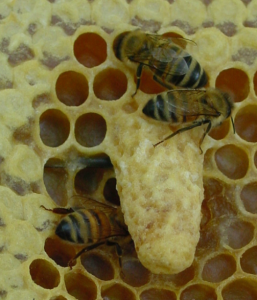 In the natural cycle of things, when a hive perceives its queen is too old, if her pheromones start to decrease or she gets sick, injured or disappears, the colony will choose eggs or very young larvae (from amongst those that the queen herself has laid) as candidates to replace her. Those selected become the future queen contenders and one of them, generally the first born, will emerge as the new La Reina of the hive. I have never killed a queen bee and never will. I trust a hive to replace their queen, making this kind of important decision for themselves on bee time, exercising bee preference and intelligence. Who of us can really understand the long-deep and long-term effect on a lineage of bees when we frequently requeen? I am distressed by this choice; I feel we are sabotaging the health, resilience, and well-being that come from bees self-determining the succession of their queen. I feel the practice of requeening also disturbs the innate wisdom of the sacred soundscape and an intergenerational aural continuity that we barely understand as bee stewards. We have been tampering with the bees in this way (and other ways) at a very core essence level for over a century. I believe we are shattering and fracturing the songlines, these very particular and unique vibrations that help create and sustain lineage across time, bonding the queen with the colony, the colony to itself and with the particular place on the web of life they are part of. I believe it is essential that bees select the best eggs for their future queen candidates for all the mysterious reasons they do, for their own divine purpose and destiny. So many of our practices have diminished their input about their future. We’ve become hasty, often putting commercial needs that center on pollination and honey, before the welfare of bees. And we are asking one of the hardest working creatures on earth … to work harder. 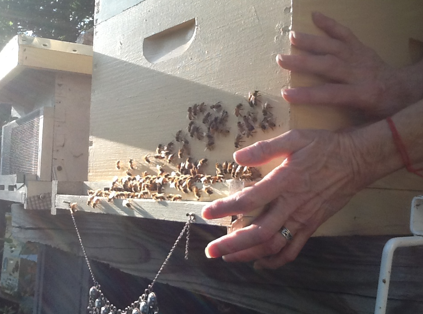 Honeybees have long been some of my highest teachers. Between teaching, speaking, and advocating for them on the Good Bee Road and the time I get to spend with them in the bee sanctuary where I live, I feel immersed in a sea of gratitude for their inspiring presence in my life. The most seemingly ordinary moments with these precious wing-ed ones can spontaneously combust into sudden clarity and grace … lifting the veils and dissolving the habitual in favor of a present which is alive and bursting with creativity, a humming sense of purpose, and well-being. 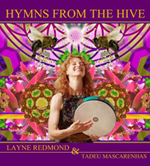 When I hear The Song of the Unborn Virgins and other hymns from the hive (as Layne called them), I feel something holy moving through the continent of me … recalibrating me in a profound way and pouring blessings everywhere in my consciousness. For this and so much more, I remain infinitely grateful for my astonishing and astonished life with the bees. Long live the queens. Blessed be. Blessed bees. 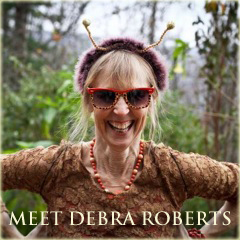 Debra Roberts ©HolyBeePress.com / Thanks to Filiz Telek and Barbara Schacht Randall for photos. It is full-on spring here in Appalachia and the bees are rocketing in and out of their hives like tiny cannonballs. Wild cherry, apple, pear, plum, blueberry, and other blossoms beckon. Soon the tulip poplars, black locust and black raspberry, the heart of the honey flow plants, will bloom in this astonishing season. 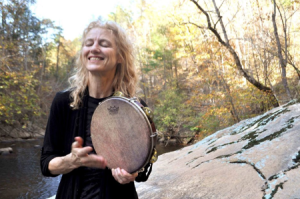 The pulse, hum and vibration in the air, this sacred sound and feeling-scape, is palpable, pure and revitalizing. Spring in the bee sanctuary. I am very blessed by invitations to teach and travel in the world on the Good Bee Road. 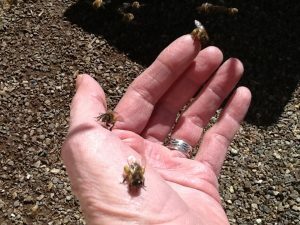 I meet remarkable people (two-legged and wing-ed) and one of the greatest pleasures of my life is to explore the many respectful, reverent and benevolent ways that people choose to express their relationship with bees. 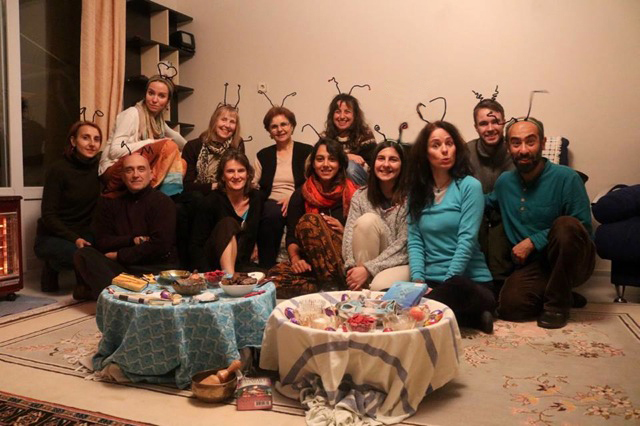 Last year, I returned to Turkey to share my bee-loving heart in Istanbul (my most favorite city in the world) and also to join a small constellation of extraordinary people from England, Estonia, Greece, Iran, Germany, and Turkey. We converged as one hive and collaborated in the seeding, dreaming and emergence of Simorgh Wisdom School. We also celebrated Nowruz together, the Persian New Year, which marks the beginning of spring. The Simorgh hive … I often bring antennae when I travel. A man who lived locally was also invited to join us for some of our meals, a Syrian refugee who had cobbled together a life in that small town near the Aegean. Over tea one afternoon, I asked him about bees. I am always curious about people’s practices and I wondered about Syria. He replied that while beekeeping was not his family’s main focus (they had a lucrative business in a city before the bombings), they had some land in the country and had kept hives there in the past. Every spring, he said, beekeepers moved their bees to the Black Sesame flowers, which he also called Love in the Mist, and the honey that bees made from that nectar was particularly treasured. And now this tradition has been fractured. Many beekeepers can no longer move their bees at all because of the war. When we consider some of the challenges bees face these days, we often think about diseases, mites, encroached habitat, and the increasingly toxic environment bees try to survive in … one that has become saturated with “ides” (pesticides, fungicides, herbicides), neonicotinoids, glyphosate (think Roundup), GMOs, and other unfortunate human choices. But there is another threat to bees that came into my consciousness last year. War. The war in Syria is utterly devastating all life there, including the honeybees. The field of me shifted with his stories. Syria began to have a face and I could feel her broken heart. As I asked more questions, he came to understand more of my own call, that I am a free-range bee lover who shares inspiration with others from my journeys. I recall how heart-stoppingly still he became at one point in the conversation. He conveyed that he was fine for his stories to be passed along, but to please not reveal his name nor show his photo, because his life might be endangered. I cannot describe how sobering a request that was nor how carefully I have honored it ever since. As the tea flowed amongst us, his story poured out. He had to flee Syria (through a minefield, at night) to avoid being conscripted into the army to fight a war he doesn’t believe in. He hasn’t seen his wife and children for years. His youngest daughter was about four months old when he left and is now, I believe, four. His children have not attended school for the last five years. So many schools have been destroyed, so many places in Syria are unsafe, that many children have suffered this same fate. His successful family business was destroyed in a large city and later, their home was directly bombed (within hours of the family fleeing to a more remote location in the country where they own a tract of land). He and his wife agreed that he would leave Syria while she and their children would stay on the land, the only thing left that they owned. They hoped it would be a safe rural refuge for his family and that he would join them to rebuild a life together there, once the war is over. One of his lifelines was a collection of family photos he carries on a thumb drive, pictures that are years old that he brought another evening. The precious united nations of us sat on the floor, gathered around a laptop. We met his family, image by image. We asked for each of their names and he called them out … aunts and uncles, parents, cousins, nieces and nephews, his wife and children … naming them, one by one. At one point he was overcome by emotion. I don’t think anyone had expressed interest in his family in such a way since he had been parted from them. And it was humbling how un-bitter he was. Immeasurably sad, yes. Sorrow had settled into his life, adding years to his face, but not bitterness. I met some of the sorrows of the world on that trip. I saw lifeboats being confiscated in the Aegean to prevent other refugees from fleeing to safe harbor, to the more receptive islands in Greece. A new friend in Istanbul told me that some of the people from the village he grew up in, who are traditionally fishermen, have found it more lucrative to deliver Syrian refugees to places they hope will let them stay … and to take them for a fee. Two other friends in Turkish cities had lost people they cherished in suicide bombings. I felt the anxiety of other beloveds of mine, some professors and one in the entertainment industry, who had signed a petition for peace in their country (something many of us have done hundreds of times) and are now on a list to be investigated. And every single day, I also met the most heart-opening, beautiful people, tending to the sacred in the ordinary tasks of living, extending themselves through greetings, gestures, smiles, eye contact, time in their bee yards, stories, music, food and (the inevitable) tea in the most welcoming and generous ways. If ever there were a true eco-green-holy-hearted-sustainable choice, I believe it is to compost many of our thoughts and fears about each other and to tend that compost pile as if our life depended on it, because it does. I raise a glass to a man I cannot name, whose face I cannot show, and who will probably never read this … and to the beekeepers who cannot move their bees to the black sesame flowers and other nectar sources because it is unsafe … to those who have left their bees (and everything else) because they are fleeing for their lives … and for the people and bees who have already perished (may peace be upon their souls). My heart feels the sharp edge of broken-ness that such things should ever happen to anyone. Anywhere. Ever. Amongst the epic events of this last year, we also lost our home to fire while I was on that trip to Turkey. We are just now on the threshold of getting back on our feet. Our local and world community responded so generously to us that we remain on our knees in gratitude. And I am ever mindful that we did not have to flee to hostile borders and our home wasn’t destroyed because of an intentionally aggressive act. Challenging things happen in life … and then there are tragedies. Ours was not the latter. I have felt so many things across this last year as I follow what is happening in Syria, Turkey, Standing Rock, Flint Michigan, Washington DC, North Carolina, and other places and spaces. And despite the monumental hardship that is so much in evidence in our world, as well as the chaos we experienced with our own hallowed house fire, I have also felt a heightened awareness of that which never changes, ever. There is a strange river of peace that runs beneath everything, that the bees enliven and help me re-remember every day of my life. Heart-breaking and heart-opening events strangely coexist, stretching my capacity to abide with such extremes and turning me inward towards the only shore that makes a holy difference … that of my heart. Photo, courtesy of Walker Silsbee. When I returned from Turkey, my friend Walker Silsbee was sculpting a Syrian man fleeing his country. It is now completed and I am immensely moved by it. I think of our friend. 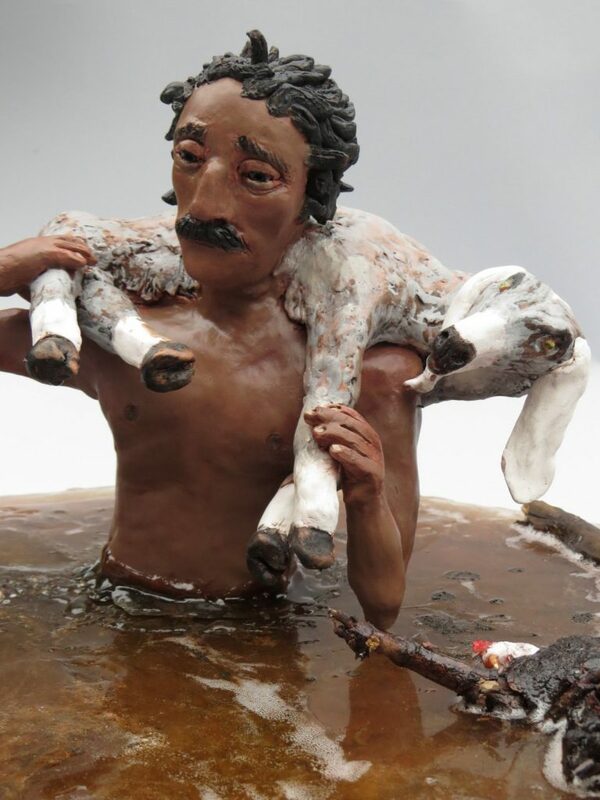 He didn’t take a sheep with him when he left Syria nor did he escape through water. He did disappear in the night, miraculously making his way through a minefield with a tiny thumb drive tucked in his pocket, carrying pictures of the people he loves most in the world. Through the peculiar and brilliant quantum physics of the heart, I feel your presence and preciousness in the world, my friend. You extended an invitation to us to come visit your pistachio orchards during the harvest time, once the war is over, and I carry that possibility in my heart as a prayer for peace. This is for you, from my heart to yours, my family to yours (two-legged, four-legged, root-ed … and wing-ed). Here’s to Love in the Mist and the love in our midst, now and always. PS I invite you to The Sacred Path of Bee if this journey speaks to your heart. I invite you to consider anything and everything that speaks to your heart. 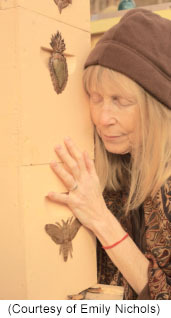 THE SACRED PATH OF BEE SERIES … is launched! It is a full fat summer’s day here in Western North Carolina. The bee sanctuary is fragrant, humming, thrumming and bursting with more health and vitality than ever before. My heart is full. These wing-ed beings bring me such joy. At long last, the Sacred Path of Bee online series is completed. I am profoundly grateful to all the many patient, beloved friends from around the world who have kept gently prodding me to complete this. I want to express my thanks to some people that made this strange creature called an online series possible and for the fertile field of nectar and pollen they are in my life. And I want to begin with Layne Redmond. 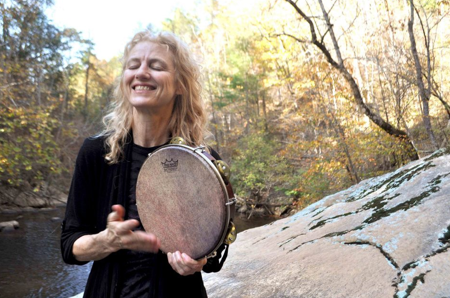 We fell into friendship from the moment of first eye contact, there in front of the Fine Arts Cinema in Asheville, just as she was about to join her fabulous students in drumming to open a documentary that included an interview with Layne. She and I picked up some ancient, comfortable and familiar thread from the second we met. I probably would not have done this series at all if she hadn’t kept saying, “We should do this!” (meaning the series) so many times, in her bright chirpy cadenced voice that I can still hear in my internal soundscape. I swam in the Ocean of Yes with Layne, as I do with a handful of beloveds in my life. When she passed in late 2013, I felt like a baton got handed to me in the softest and most compelling way … not to be her, but to continue stepping out as the bee-sotted soul that I am. Thanks to Layne and others, I’m out of the sacred bee closet now … and what a lot of fine company I have in this world. I also want to thank my husband Joe for his generous and loving patience. This series took almost two years to complete (I thought it would take four months). I am so supported by this beautiful man in every way. Joe told me when we were dating that he has known all his life that he came into this world to support the feminine. And he has and does … with his grandmother, his mother, his sister, his many women friends … and with me. I thank my lucky stars the day I met you, Joe Roberts. And to you, the ten amazing beings who took time from your incredibly busy lives to bless us with your voice here, I salute you as the Bantus greet one another at night … as walking stars … with gratitude for your presence in our lives. To Larry Cammarata, Laura Ferguson, Jacqueline Freeman, Horst Kornberger, Mekare, Glenis Redmond, Tracey Schmidt, Jeff Scmitt, Filiz Telek, and Kaylynn Sullivan TwoTrees, I raise my glass. My life, this series, the world, and the honeybees are infinitely enriched by your beautiful bee-ingness. And to you, Apis mellifera, the sweet honey-bearing bees who I love and adore, you have colonized my mind, heart and consciousness … called out the nectar of me and transmuted it into honey. For this and a thousand things more, I am eternally grateful. This series is for anyone and everyone, from my heart to yours, to inspire you on your own path of bee love, whether you have bees or not. No beekeeping experience is necessary, just your appreciation of bees. This is not a technical series. 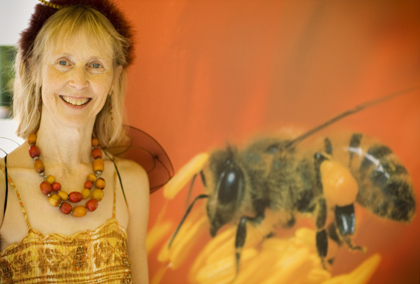 It is a journey to deepen your own relationship with honeybees and the sacred life we all share. All the ground covered here … the stories, the wisdom, the insights, the experiences … everything ultimately relates to our relationship with all life and whomever we care for. I have long believed that love is the ultimate activism. Come one, come all. “The souls of people, on their way to earth-life pass through a room full of lights. Each takes a taper–often only a spark to guide it in the dim country of this world. But by rare fortune, some souls are detained a little longer. They take time to grasp a handful of tapers, which they weave into a torch. These are the torch-bearers of humanity, its poets, seers and saints, (beekeepers and bee lovers) who lead and lift the race out of darkness toward the light. They are the teachers and saviors; the light bringers, way-showers and truth-tellers. Without them, humanity would lose its way in the dark”. ~ Plato (and Debra Roberts). BEE DELIRIUM … the bees are bursting out of their britches! I have fallen in love with pollinators … and in particular with Apis mellifera, the honey bearing bee … one of the greatest teachers in my life. At the peak of summer, my family expands to almost a quarter of a million in number. There is not a day that goes by when I don’t think about these precious winged beings. 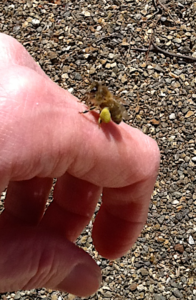 I am a shameless Apis mellifera-loving hussy. I talk bee and English is now my second language … Come have holy bee communion. I’m glad you’re here. A delightful music video for children! DESCANSOS FOR THE BEES: Kaylynn Sullivan TwoTrees’ memorials commemorate the loss of our honeybees. "Web Design with the Eye of an Artist, the Hand of a Writer, and the Soul of a Poet"
Grateful thanks to Clare Melinksy for the amazing honeybee lino-cut.